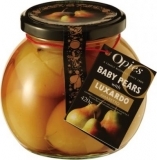 Peaches with Courvoisier presented in a glass globe jar they make an ideal birthday or Christmas gift for food lovers. 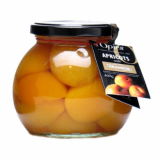 Deliciously sweet, these plump, ripe peach halves are preserved in a light syrup laced with Courvoisier cognac. 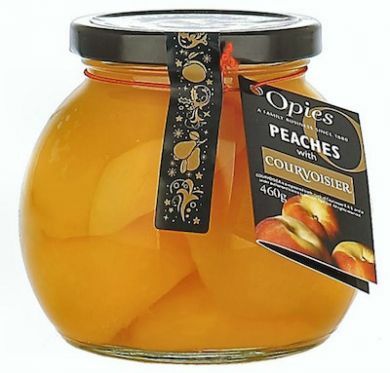 These Peaches with Courvoisier are delightful on their own or try them with ice cream, yogurt or fresh cream. Peach halves preserved in a light Courvoisier syrup. Serve with ice cream, yogurt or cream. This product contains alcohol. You must be over 18 to purchase. Please ensure your customers are over 18 and aware that drinks or dishes made with it are alcoholic. This product is made in the factory where following allergens are handled: walnut, mustard, dairy, sulphites, celery, soya. Store in cool dry place. 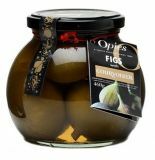 Once opened, keep refrigerated and use within 14 days. 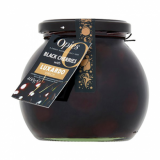 Once opened, keep refrigerated and use within 14 days.